Ranger secures your Hadoop services, providing a centralized console to manage user access to the data in your HAWQ cluster. Native HAWQ authorization provides SQL standard authorization at the database and table level for specific users/roles using the GRANT and REVOKE SQL commands. HAWQ integration with Ranger provides policy-based authorization, enabling you to identify the conditions under which a user and/or group can access individual HAWQ resources, including the operations permitted on those resources. Note: The HAWQ GRANT and REVOKE operations are not permitted when Ranger authorization is enabled for HAWQ; you must configure all user and object access using Ranger policies. Name and provide a description for the policy. Identify the HAWQ resource(s) to which the policy applies. Identify the conditions under which access to the HAWQ resource(s) should be allowed. Enable/Disable audit logging for the policy. The Ranger policy editor provides resource name look-ups. When you start entering characters into a resource field, HAWQ populates a pop-up list with all existing HAWQ object names that match your text. When you define a HAWQ policy using the Ranger Admin UI, you identify the Groups/Users to which the policy will permit or deny access for the specified HAWQ resource(s). 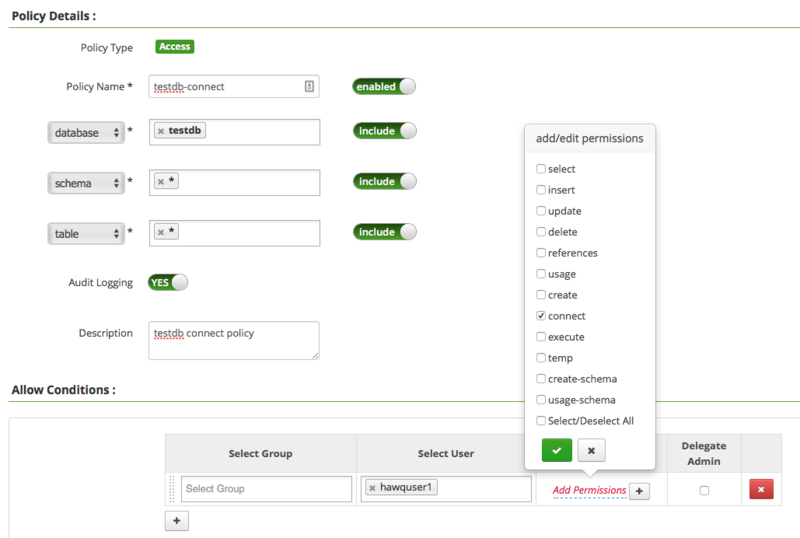 You also identify the permissions for the resource(s) that you want to assign or deny to those users. Specify this information in the Create Policy > Allow Conditions and Deny Conditions panes of the Ranger HAWQ Policy editor. You create HAWQ users with the createuser command line utility or CREATE ROLE SQL command. These HAWQ users may or may not correspond to an underlying operating system user. With either HAWQ native or Ranger authorization, you identify the HAWQ database objects to which you want these users/roles to have access. Ranger includes a UserSync process that synchronizes users and groups on the Ranger administration node. You can synchronize users and groups from the operating system (default), from a file, or from LDAP/AD services. After the synchronization source is identified, the Ranger UserSync process automatically detects when new users are provisioned on the Ranger administration node. Note: If your HAWQ cluster includes HAWQ-only roles (roles that have no associated operating system user), then you must manually configure a Ranger user for each such role. Use the Ranger Admin UI Settings > Users/Groups page for this purpose. You can identify one or more users and/or groups to which a policy provides or denies access in the Allow/Deny Conditions of a HAWQ policy. These users/groups must be known to Ranger. Group <group-name> The group(s) to which you want to provide or deny access. All groups sync’d from <ranger-admin-node> are available in the picklist. User <user-name> The user(s) to which you want to provide or deny access. All users sync’d from <ranger-admin-node> or explicitly registered via the Ranger Admin UI are available in the picklist. Note: Group-based assignment of policies is not yet supported in HAWQ. Assign policies to users only. create Create a table, function, sequence, etc. These permissions map closely to the privileges that you can assign using HAWQ GRANT commands with native HAWQ authorization. Note: The HAWQ Ranger policy editor always displays the complete list of HAWQ permissions. This list is not filtered by the operations that are actually supported by the resource(s) you have selected. Refer to HAWQ Resources and Permissions for the specific permissions supported by each HAWQ resource. Additionally, SQL Command Permissions Summary summarizes the policies and permissions required for some common HAWQ SQL commands. Ranger evaluates policies from most to least restrictive, searching for a policy with sufficient privileges to allow the requesting user to access the identified resource(s). Deny conditions are evaluated before allow conditions. Refer to the Ranger User Guide and Deny-conditions and excludes in Ranger policies for detailed information about the Ranger Admin UI and Ranger policy evaluation. Your HAWQ cluster includes a HAWQ user named hawquser1 who has default privileges on a database named testdb. hawquser1 creates table99 in the public schema of testdb and inserts data into this table. You enable Ranger authorization for HAWQ. You create the HAWQ policies necessary to restore hawquser1 access to the database testdb and the table table99. When you enable Ranger authorization for HAWQ with the default service definition in place, the configured policies assign the gpadmin administrative HAWQ user all permissions on all database objects. Other HAWQ users have no privileges, even for the objects that they own. psql: FATAL:  permission denied for database "testdb"
Notice that hawquser1 no longer has permission to access testdb after Ranger authorization for HAWQ is enabled. 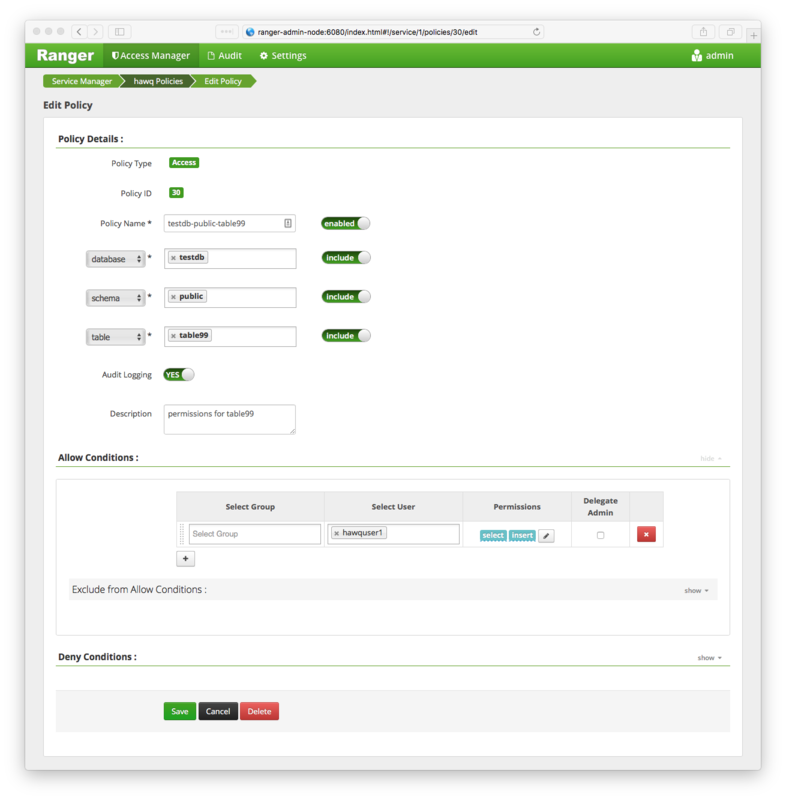 You configure HAWQ Ranger authorization policies using the Ranger Administrative UI, which you access at http://<ranger-admin-node>:6080. Log in to the Ranger Administrative UI as the Ranger admin user. Open the Settings > Users/Groups page, and verify the hawquser1 user has been sync’d to Ranger. Click the Access Manager button and select the default HAWQ service definition named hawq. The List of Policies: hawq page identifies all currently defined HAWQ policies. These policies provide all permissions on all HAWQ database resources only to the gpadmin user. Create a policy for hawquser1 that provides CONNECT privilege to the testdb database. Notice that both the schema and table field values are set to * in this policy. Wild-carding both of these fields is required when defining a database-level policy. Save the policy named testdb-connect. WARNING:  usage privilege of namespace public is required. Connect privilege to the testdb database is not sufficient for hawquser1 to access table99. The WARNING message indicates that hawquser1 is missing privileges for the public schema. Create a policy for hawquser1 that provides USAGE privileges on the testdb database public schema. Notice that the table field value is set to * in this policy and that you assign the schema-level usage-schema and create permissions. 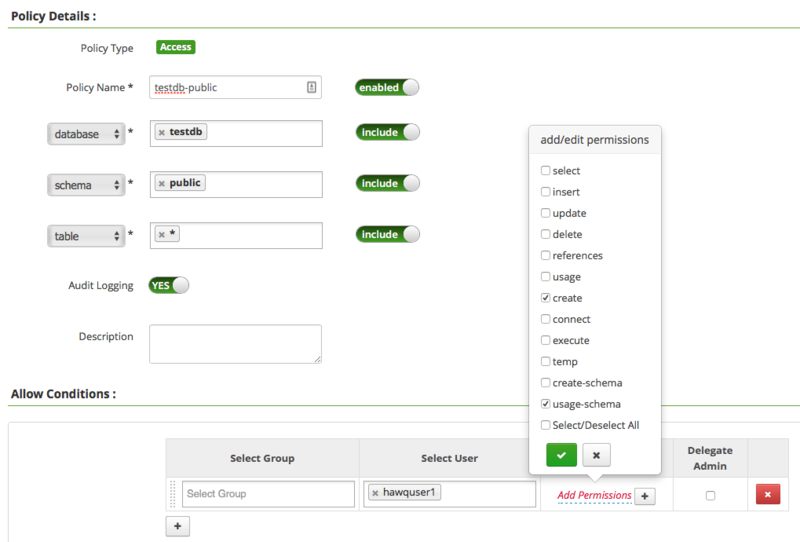 The usage-schema permission allows hawquser1 to use the public schema. The create permission allows hawquser1 to create objects in this schema. Save the policy named testdb-public. Access to the testdb database and public schema is still not sufficient for hawquser1 to select the data in table99. You must explicitly configure access to this table. Create a policy for hawquser1 that provides SELECT permission on the table named table99. Save the policy named testdb-public-table99. hawquser1 regains access to table99 only after the testdb-connect, testdb-public, and testdb-public-table99 policies are assigned. leaf permission - the permission applies to all instances of the resource at the leaf level. Policies 1 and 2 collectively permit hawquser1 to access the public schema of testdb and to select from table99 in that schema. The wildcard in Policy 1 applies the usage-schema permission to the parent resource (the schema public). Policy 2 restricts the select operation to the specific table named table99. Policy 10 permits the policy holder to use the public schema (equivalent to Policy 1 above) and select from any table in the schema. In this policy, select is a table-level permission, and the wildcard character applies this permission to all instances of the leaf table resource. Create policies before enabling HAWQ-Ranger authorization. This will ensure access is available to users without any downtime. Define more restrictive HAWQ policies first to ensure that you do not accidentally provide unwanted access to specific resources. Identify and configure your Ranger auditing requirements before enabling HAWQ-Ranger authorization. Administrators periodically perform maintentance tasks on the HAWQ cluster, including vacuuming and analyzing databases. Users performing these operations must be the owner of the databases, and must be explicitly assigned the permissions to do so, just as you would for general database operations. The ANALYZE operation requires select permission on the table to be analyzed, as well as usage-schema permissions on the schema in which the table resides. The VACUUM ANALYZE operation requires select permission on all table(s) specified, as well as usage-schema permissions on the schema(s) in which the tables reside. The VACUUM and TRUNCATE operations require usage-schema permissions on the schema in which the table resides. The psql search_path session configuration parameter affects Ranger access control checks for CREATE operations. The object will be created under the first schema in the search_path in which usage-schema permissions were assigned to the user. The schema search_path does not affect SELECT or other operations. When Ranger authorization is enabled for HAWQ, members of HAWQ roles assigned create database permissions must be provided pg_hba.conf access to the postgres database to use the createdb command line utility. This configuration step is not required for CREATE DATABASE operations invoked within the psql shell. CREATE LANGUAGE commands (superuser-only) issued for non-built-in languages (pljava, plpython, ..) require the usage permission for the c language. Using built-in functions may generate the message: “WARNING: usage privilege of namespace <schema-name> is required.” This message is displayed even though the usage permission on <schema-name> is not actually required to execute the built-in function. The HDFS xasecure.add-hadoop-authorization property determines whether or not HDFS access controls are used as a fallback when no policy exists for a given HDFS resource. HAWQ access to HDFS is not affected when the xasecure.add-hadoop-authorization property is set to true. When this property is set to false, you must define HDFS Ranger policies permitting the gadmin HAWQ user read/write/execute access to the HAWQ HDFS filespace. Access to HDFS-backed PXF external tables is not affected by the xasecure.add-hadoop-authorization property value, since the pxf user is a member of the hdfs superuser group. Hive Ranger policies cannot control PXF access to Hive tables. When Ranger authorization is enabled for HAWQ, the gpadmin user has access permissions to all Hive tables exposed through PXF external tables and HCatalog integration. Other HAWQ users may gain access to Hive-backed PXF external tables when provided usage-schema and create permissions on the public or any private schema. To restrict this access, selectively assign permissions to the pxf protocol. HCatalog access to Hive tables is restricted by default when Ranger authorization is enabled for HAWQ; you must create policies to explicitly allow this access.